Everything Just So: Wishing You A Glamorous 2015! Wishing You A Glamorous 2015! A 1975 necklace for María Félix by Cartier Paris. Photo by Vincent Wulveryck for Cartier Collection. I would like to wish all of you one glamorous and fabulous 2015 and helping me with this task is a pair of glittery crocodiles! This 1975 Cartier Paris necklace was a special order made for the Mexican actress María Félix. It is currently on display at the Denver Art Museum exhibit Brilliant: Cartier in the 20th Century. I’m not necessarily into crocodiles, but I love the completely over-the-top look of the necklace, not to mention the skill it took Cartier jewelers to create it. 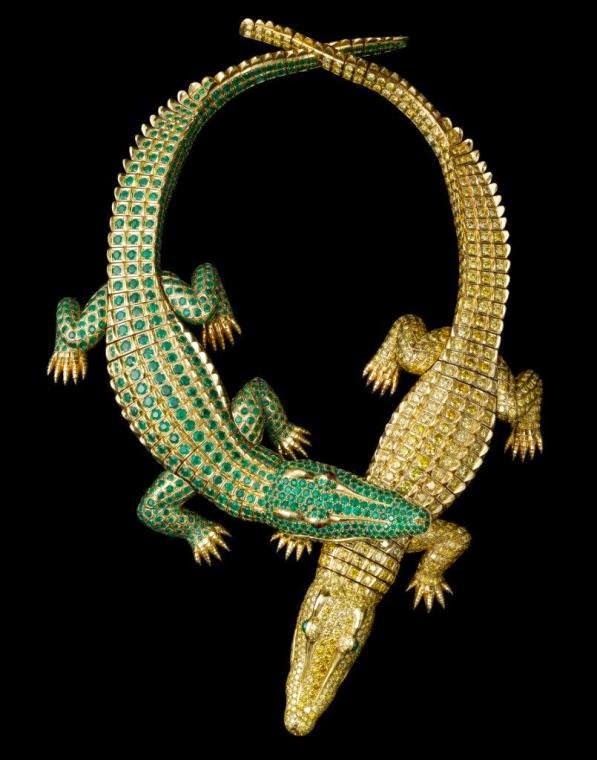 Each crocodile, one of fancy yellow diamonds, the other of emeralds, is completely articulated and each can become individual brooches when they are separated. Stunning! Wow. Photo by Vincent Wulveryck for Cartier Collection. From the book Amazing Cartier by Nadine Coleno. 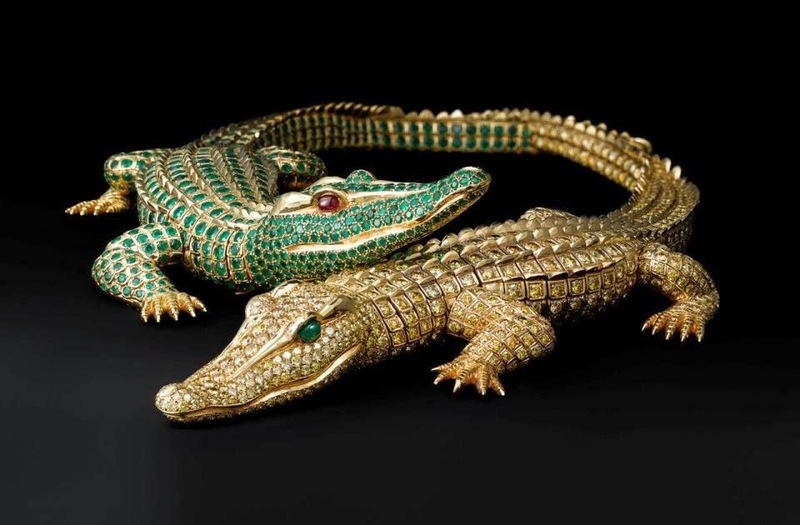 With these crocodiles for inspiration, go pile on that jewelry for 2015, whether fine or costume. María would want you to! 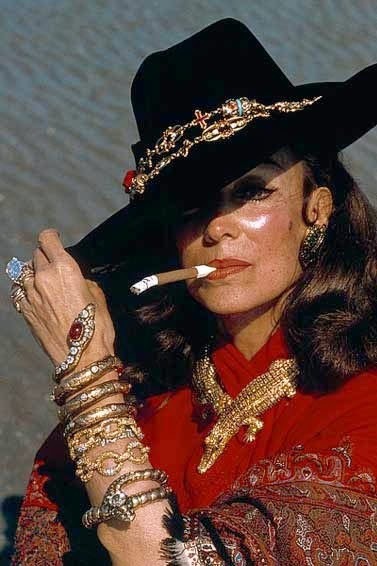 María Félix wearing the necklace (and a lot more!). You'd think Cartier would have sprung for an ashtray. Your my kinda gal Jill. Felix looks incredible with her over the top accessorizing. Definitely not a look that everyone can pull off. Such bold pieces. I'm amazed! Happy New Year, Jill! I am excited about what lies ahead for all of us! I would not wear this, but I love looking at others who do! Thanks! :-) Happy New Year, Jill! You've done it again - found something OTT spectacular. Love it! Wouldn't wear it, but there are only a very few people who could pull this kind of look off. Keep on finding these beauties for us in 2015! Wow! Now that's a statement necklace!!! I was a newbie to your blog in 2014 & look forward to another great year. Your blog was so much fun this past year. So glam! Happy New Year!